Batch messages can be sent immediately, scheduled for future dates and throttled according to audience size or max number of batches. Messages are set to send immediately by default. 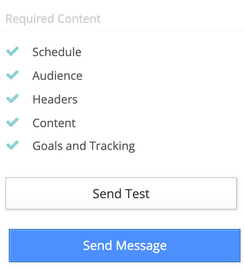 When all required content is met, you will see the option to Send Message. If you would like to schedule a message to be sent on a future date, click the Edit button under Schedule and choose Schedule for future date. Choose the date and time you would like the message to be sent and click Save. 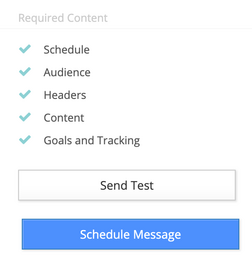 If all required content is completed, you will see the button Schedule Message. Click the button to schedule the message for a future date. The message will then appear in the Scheduled Messages list. Clicking on the message in the list will give you the option to edit the message or view the message details. 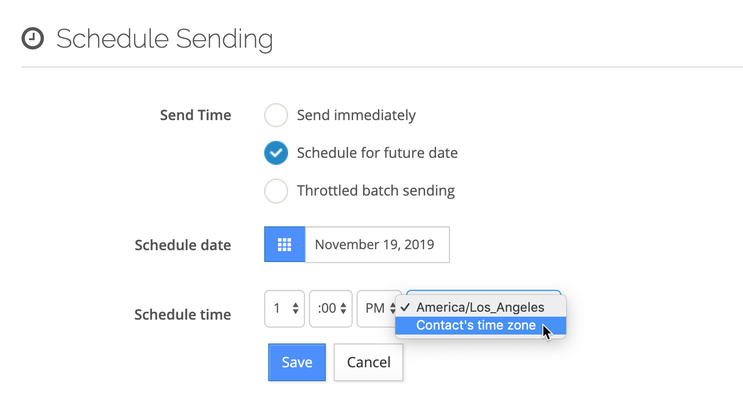 When scheduling a message for a future date, you are able to set the scheduled send time according to a contact's time zone. Before the option will be made available, you will first need to designate a contact attribute as the contact's primary time zone. When scheduling a message choose contact's time zone in the menu under Schedule Time. A contact attribute must be set as the primary time zone or the time zone option will not appear when scheduling a message. If a time zone value is not present in the primary time zone attribute, the message will send according to the account's time zone setting. There is a need to spread out sending volumes because your domain has issues scaling to large volumes of inbound traffic. You are warming an IP or sending to a list of newly acquired contacts and there is deliverability concern with a particular volume. Note: Message throttling may not be compatible with Inbox Placement tests and experiments. Edit message schedule and select Throttle batch sending. Select to batch by either by audience size or max number of batches. Audience size per batch - enter the audience size per batch and the number of batches will be calculated automatically. Max number of batches - enter the max amount of batches and the audience size per batch will be calculated automatically. Choose batch interval and allow days/hours. 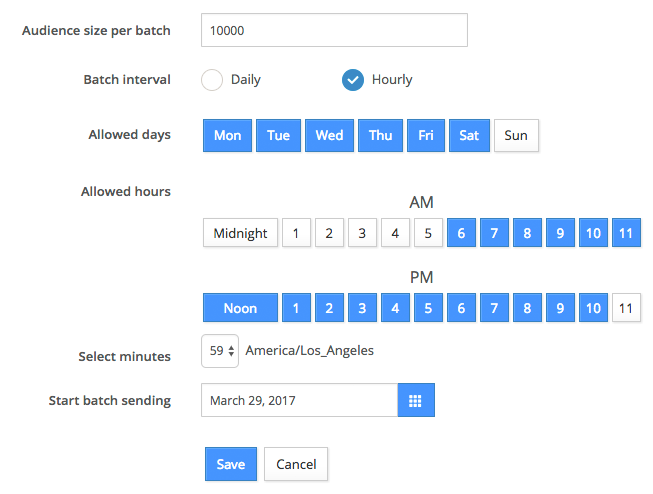 Batch interval - whether to send once a day or on specific hours of specific days. Allowed days - which days of the week you would like the message to send. Allowed hours - which hours of the day you would like the message to send. Select minutes - the minutes of the hours of each day. For example, 10 am and 30 minutes will send at 10:30 am. Start batch sending - the date after which the batch sending intervals will start. Start time - the time after which the batch sending intervals will start. Note: The messages will start sending at the first interval after the start date and time. Be sure to select all days and times you would like the messages to send. For example, you could send 1,000,000 emails at 10,000/hr between 11pm and 6am on all days except Sunday. Note: Audience counts are re-calculated for each batch of a throttled send. Therefore it is possible for an audience count to change during the throttling time period. In the next article learn about message performance.